Eggless breakfast recipes can be hard to come by, but they're a necessity for vegans. Morning treats such as pancakes, stratas, waffles, muffins, and coffee cakes most often come from egg-based batters, so vegans may be left nibbling toast at brunches and breakfast buffets. Eggs are used because they act as a leavener and emulsifier in batters, and they also improve the taste in many recipes by adding fat. If you can find dairy-free ingredients that fulfill those purposes, you can prepare eggless breakfast recipes anytime! Each of these recipes is one step beyond the traditional cereal and toast, so they fit whether it's for one special morning all by yourself or a brunch party with friends. This batter makes four to six large waffles or about 12 pancakes. Preheat the griddle, frying pan, or waffle iron. In a small bowl, whisk mashed banana with milk and vanilla extract to combine. Reserve the sliced banana. In a large bowl, whisk oats with the flour, baking powder, cinnamon, and nutmeg. Make a well in the center of the dry ingredients, and pour in wet ingredients. Use a spatula or wooden spoon to mix the batter until it is barely moistened. A few lumps are OK and even preferable. Pour batter onto the waffle iron or griddle, and top each portion of batter with sliced banana. Serve the pancakes or waffles while they're still hot. This batter makes approximately a dozen muffins. You can also use it to make one full loaf of tea bread--bake for 45 to 50 minutes instead of 25. 1/4 c. margarine or vegan "butter"
Preheat your oven to 350 degrees Fahrenheit. If using frozen berries, let them sit at room temperature for at least 15 minutes before adding them to the batter. Coat 12 muffin cups with cooking spray or line each cup with a paper liner. In a large bowl, cream margarine or "butter" together with sugar. Stir in the applesauce, vanilla extract, and milk. In a separate bowl, whisk together the flours and baking powder. Stir dry ingredients into the wet batter just until moistened. 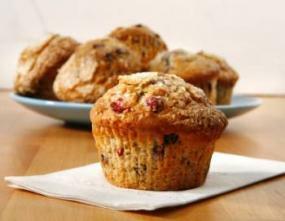 Fold berries into the batter, and distribute the batter evenly among the muffin cups. Bake at 350 degrees for 25 minutes or until the muffins are golden brown at the edges. Let them sit in the pan to cool for 10 to 15 minutes before you unmold them. Cool the muffins on a wire rack. 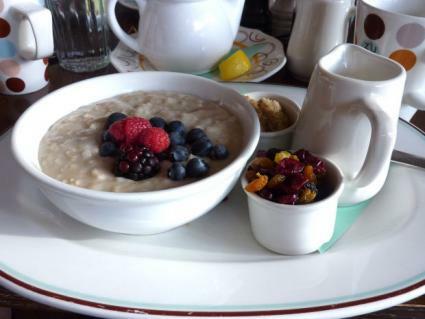 Prepared in a slow cooker, this recipe makes enough oatmeal to serve four people. 1 T. margarine or vegan "butter"
Combine all ingredients in the bowl of a slow cooker or crock pot. Mix thoroughly, and set the machine to low. Let oats cook for four to six hours or until they have achieved the desired tenderness. Being committed to a vegetarian or vegan lifestyle doesn't mean you can't still have some of your favorite breakfast food. Waffles, pancakes, muffins, and a bowl of steamy oats are all still on your menu when you use these delicious recipes. Give them all a try.